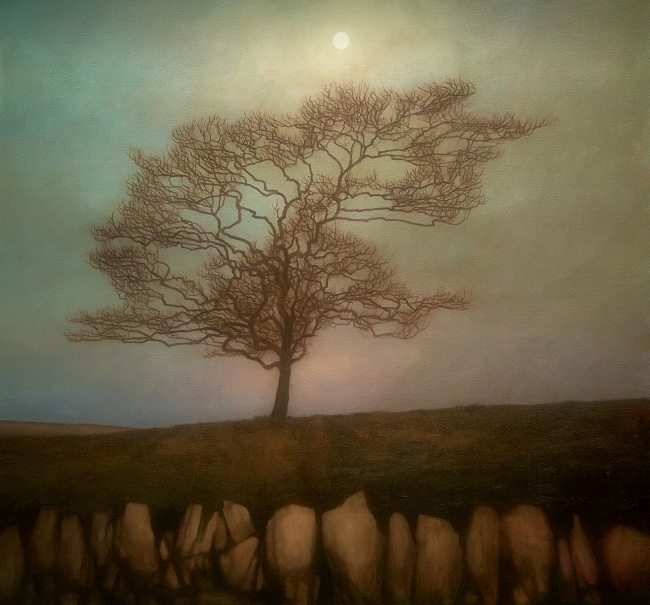 A commissioned work based on an earlier painting of the same subject - a single tree on Pirntaton Hill above my cottage when I lived in the Scottish Borders. The trunk of this tree was worn smooth from cattle rubbing against it over the years. It had great presence and grew from the uneven ground of an early settlement, the signs of which can still be seen although knowledge of its origins appear to be lost. The Ordnance Survey map shows nothing, although iron age settlements are marked on many adjacent hilltops. This only added to its fascination for me and when working from it there was always a feeling that it might just be possible somehow to “lift the lid” on our normal reality and see the layers below.